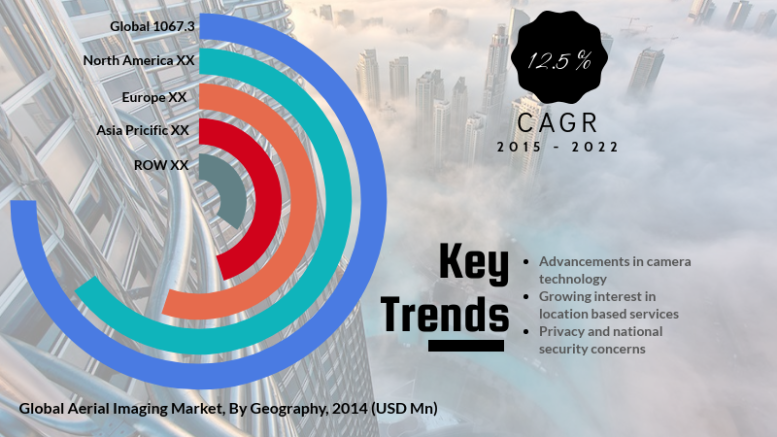 According to a new market report published by Credence Research, Inc. “Aerial Imaging Market(Government (Urban Planning, Monitoring Environmental Changes, Public Security, Energy Sector Management, etc. ), Commercial, Defense, Construction, Agricultural and Forestry, Energy and Mining, and Insurance) – Growth, Share, Opportunities, Competitive Analysis, and Forecast 2015 – 2022”, the aerial imaging market is expected to expand at a CAGR of 12.5% from 2015 to 2022, reaching US$ 2,705.0 Mn by 2022. Aerial imaging or aerial photography is a procedure of clicking images of ground from a direct-down position, generally through a camera not supported by the ground-based structure. Some of the platforms used for aerial imaging include fixed-wing aircraft, multi-rotor unmanned aircraft systems (UAS), helicopters, vehicle mounted poles, dirigibles and blimps, balloons, parachutes, rockets, kites, and stand alone telescoping among others. Air-to-air imaging is different from aerial imaging and is one wherein one or more chase planes are used to track and photograph other plane in flight. Aerial photography is a cost effective, high precision procedure used for urban planning, route design, degree calculations, and sometimes for mapping purpose. The existing market for aerial imagery solutions is still in the nascent stage of development and is well poised to offer strong growth potential over the forecast period 2015 – 2022. The global aerial imaging market is technology driven and moderately concentrated. The top four aerial imaging system manufacturers account for over 40 percent of the global market revenue. Google Inc (the U.S.), Kucera International Inc. (the U.S.), Eagle View Technologies (the U.S.), Landiscor Aerial Information (the U.S.), Eagle Aerial Solutions (the U.S.), Fugro EarthData, Inc. (the U.S.), and Aero-Metric, Inc. (the U.S.) etc. are identified as some of the leading players in the aerial imaging market. Other players including GeoVantage, Inc. (the U.S.) ,Ofek Aerial Photography (Israel), Cooper Aerial Surveys Co. (the U.S.), Digital Aerial Solutions, LLC (the U.S.), and Premier Geospatial Inc. (the U.S.) have been marked as promising and emerging players in the global aerial imaging market. Kommentar hinterlassen on "Global Aerial Imaging Market To Reach US$ 2,705.0 Mn By 2022"